Actors have occasionally been accused of ‘phoning a performance in; with this largely lamebrained excuse for a science fiction thriller, Keanu Reeves (Bram Stoker’s Dracula, the Matrix trilogy) goes one step further and texts most of his. “We are going straight to Hell,” says fellow scientist Ed as the pair start playing Frankenstein with the newly-deceased remains of Reeves’ wife and children; the rest of us are already there. At a secret lab on a remote Latin American isle (presumably chosen for that Jurassic Park vibe), Will Foster (Reeves) is using a holographic display cribbed from Tony Stark to implant memories into android brains. After a traffic tragedy wipes out his family, he and Ed (Thomas Middleditch, The Final Girls) clone new bodies to create a fresh off-the-peg domestic unit. So far, so crazy, because a shortfall in the number of amniotic pods Ed could rustle up has already forced Will (or Bill: the film can’t decide, which is typical of Chad St John’s confused screenplay) to jetison his younger daughter. Reeves demonstrates how deeply this is affecting him by delivering every line like he hasn’t slept for a fortnight (if he’s suffering from insomnia, perhaps he should try watching this film). Meanwhile, his resurrected wife Mona (Alice Eve, Star Trek: Into Darkness and Men in Black 3) is proving memories can’t be buried like last week’s trash, forcing Will into a conversation which is one of the few unexpected moments in this $30M b-movie. Enter the lab’s administrator (John Ortiz, Kong: Skull Island), who forces Reeves to channel his inner John Wick and take the action up a gear to protect his faux family. Unfortunately, the film’s closing 30 minutes are still hobbled by the lethargy and gormless technobabble of the opening 75, leaving us with a fractured and deeply unfocussed narrative. 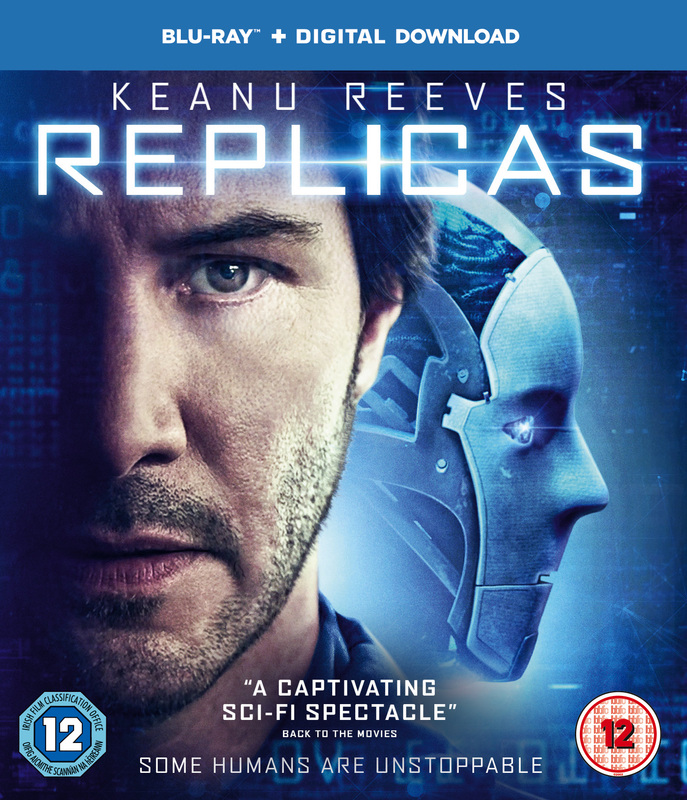 Its moral perspective is further skewed by the finale, in which the allegedly deleted daughter rematerialises and an android version of Reeves begins offering the resurrection tech to any elderly millionaire with a yen – and sufficient spare yen, or dollars, or rubles – to reboot. Reeves is reportedly back with Alex Winter right now, shooting a third Bill & Ted. Let’s hope his time-travelling includes telling Replicas director Jeffrey Nachmanoff to order a few critical rewrites and maybe get himself a more convincing lead actor (seriously, Jeffrey, your faith in Reeve’s “dramatic chops” is deeply misplaced). Extras: commentary by Nachmanoff and executive producer James Dodson; “making of” documentary, including interviews with Reeves and his production partner Stephen Hamel, who came up with the initial story; deleted scenes.